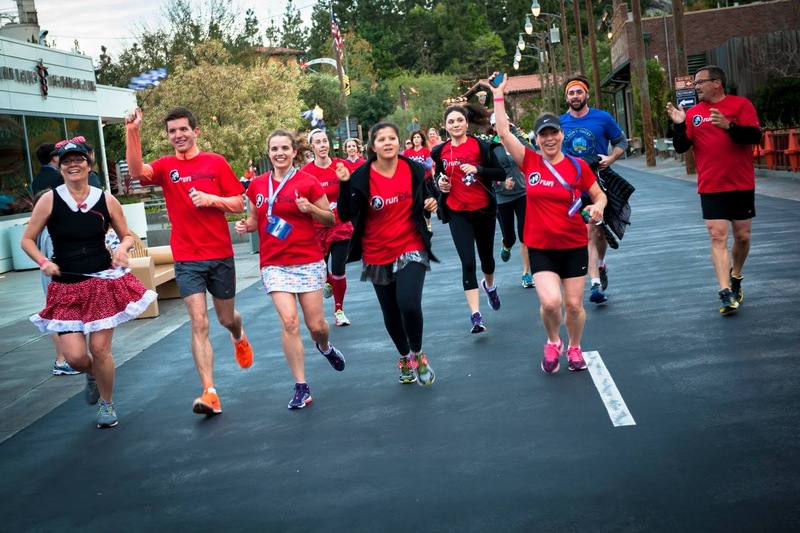 Family, Travel, Runnning help me live my best life -- what helps you live yours? 1) Spending as much time with my children and husband as I possibly can, making happy memories together as we travel to new places and share experiences. 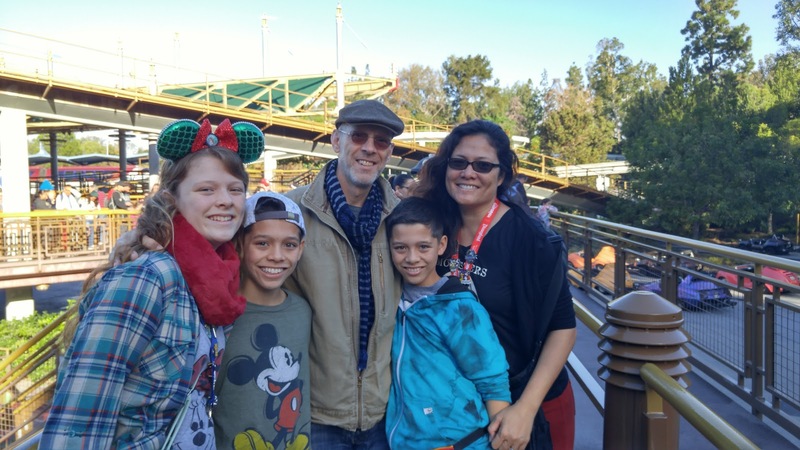 I know that there will come a time when my kids begin to live their own lives, so I want to share as much of their lives as I can, while I can! 2) Staying as healthy as possible. I want to live as long as I can in order to fulfill my first mission -- the longer I live, the more time I get to spend with my family! I want to be alive and healthy to see my children, their children, and their grandchildren enjoy their own lives. Eating right and staying active gives me the very best chance of living a long, healthy life, so that's what I want to do. 3) Stay as positive as possible. Attitude is everything! Staying positive not only keeps me happy, it reduces stress levels which can be bad for my health. So I try not to sweat the small stuff. 4) Do what makes me happy. What makes me happiest? Traveling with my family! I grew up in the Philippines and came to the US to live during my 20's. 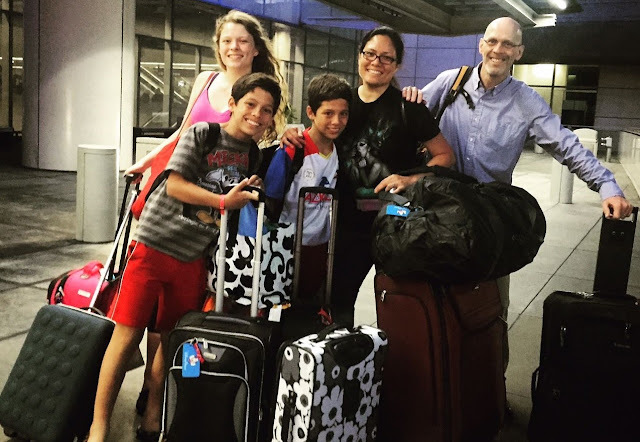 I've been traveling since I was 6, and my kids have been traveling since they were born. My husband (who is from the UK) and I consider ourselves global citizens and believe that everyone should take the opportunity to travel! We believe that because travel exposes people to lifestyles that are different from their own, it makes people more willing to try new things and more willing to see things from other people's point of view. We try to save up so we can travel every year -- the sacrifice of not eating out at fancy restaurants or watching lots of concerts or buying the latest phones and gadgets is so worth it to us if it means we can travel! 1) Most respondents -- 38% -- said that living their best life involves family. 2) My home country, the Philippines, is among the top 5 countries in Abbott's Global Pulse for Living Fully Rating, with survey respondents rating themselves with an average of 72 (on a scale of 1 to 100, with 1 being "not at all living fully" and 100 being "living fully,")!! The average score is 65. 3) The top 5 are Costa Rica (78), Colombia (77), Mexico (75), Indonesia (74), and the Philippines (72). Notice that none of the top 5 are what you would call world superpowers -- these countries have a significant number of people living below the poverty line! It's really all about attitude! Fun, huh?! Check out the site and take the quiz to share your own definition of living your best life! Or to put it another way, share your #fullosophy! I have seen many Nutcracker ballets in my time, and each one is special and unique in its own way...but I have never seen a Nutcracker quite like the one performed by the Moscow Ballet! I had the privilege of seeing it a few days ago with me daughter and mother-in-law, and it was a truly special night for all of us. Many families are familiar with the story of the Nutcracker -- Clara gets a Nutcracker from her uncle Drosselmeyer, and she dreams of battling the mouse king with him, then traveling with the Nutcracker to the land of sweets, where different sweets (peppermints, Spanish chocolate, gingerbread, etc), including the Sugar Plum Fairy, dance for her. 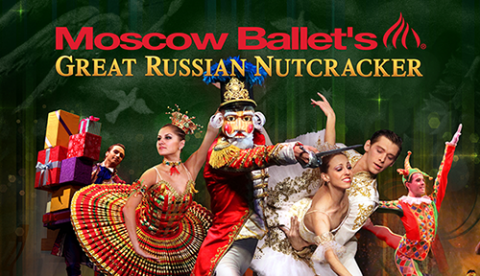 The Moscow Ballet's Nutcracker is very different. First, Clara is now Masha. Second, she doesn't meet the Snow Queen, she meets Father Christmas (Ded Moroz) and Snow Maiden (Snegurochka). Also, Masha doesn't travel to the Land of Sweets, she travels to the Land of Peace and Harmony. Instead of sweets, we see various animals like doves, lambs, bears, dragons, and elephants (symbolized by beautiful giant puppets). For all the differences, it's still the Nutcracker we know and love. We still got to enjoy Tchaikovsky's music as well as familiar characters like Drosselmeyer, the wind up dolls, the Mouse King (albeit a three headed version!) and Masha's naughty brother. The costumes and sets are absolutely gorgeous (I especially love the scenery which pays homage to the onion tops of the cathedral in St. Petersburg). It's such a fresh version that even people who have been watching the Nutcracker year after year will love it! For a Full Schedule of Event Dates/Venues and Times visit http://www.nutcracker.com/buy-tickets And use the code JOY to get the biggest discount of the season for your family! Disclosure: I recieved complimentary tickets to view and review the show, courtesy of USFamilyGuide.com. The views and opinions expressed here are my own. What makes Cancer Treatment Centers of America different? It’s hard to find someone whose life hasn’t been impacted by the C-word- cancer. For the women in my dad's family, it's actually the B-word-- breast cancer. My dad's mother (my grandmother) and all of her sisters (my great-aunts) had breast cancer. My dad's sister (my aunt) also had it. The family history doesn't stop there. My dad's father (my grandfather) had pancreatic cancer, and my dad had prostate cancer. When my dad told me about his cancer, he made it seem like it was no big deal, but I think he was trying to protect his little girl and keep me from worrying. He is a doctor, so he was very involved in his treatment and he was well-versed in all of his options. He also has a huge support network -- family, friends, medical colleagues were all there to help him. Thanks to technology and support, cancer has not made a significant dent in his quality of life. Sometimes I think it's only a matter of time before I'm diagnosed with cancer myself, and the fear sometimes gives me sleepless nights. But I remember how my dad faced cancer head on, and that gives me hope. I'm inspired and strengthened by his positive attitude -- if anything happens to me, I will get through it with my family and friends and the best medical technology I can find. I hope anyone facing cancer is lucky enough to have that! They even help with appointment scheduling, travel, and lodging, to remove the logistical stress (because fighting cancer is stressful enough!). I know that having access to cutting edge technology and a great support system really helped my dad get through his fight with cancer -- and it sounds like CTCA believes the same thing. Disclosure: This is a compensated post as part of a promotional program with CTCA and MomSelect. The views and opinions expressed here are my own. Leave on a plate (instead of cookies) for Santa! 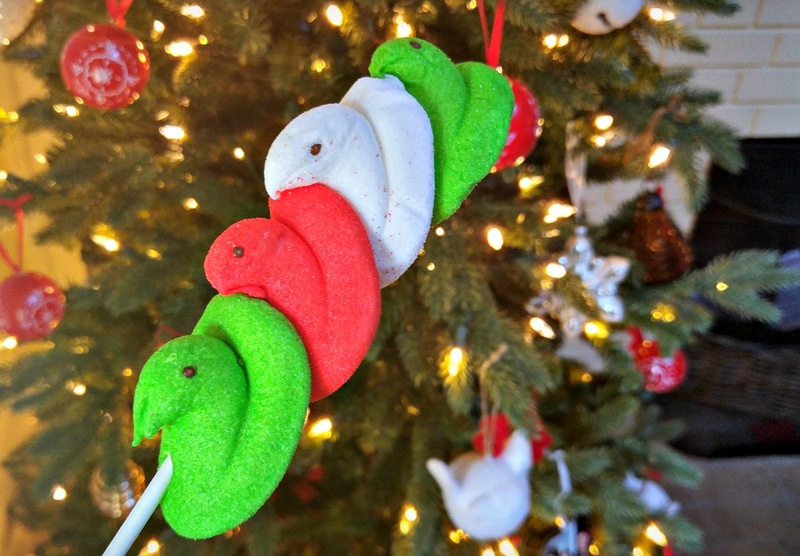 With so many different kinds of holiday PEEPS products, it's easy to make any of these 10 ideas look festive and merry. 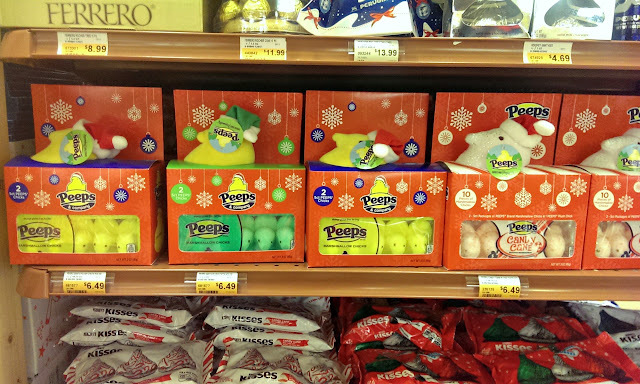 Just look at the assortment of PEEPS I saw inside our local grocery store! 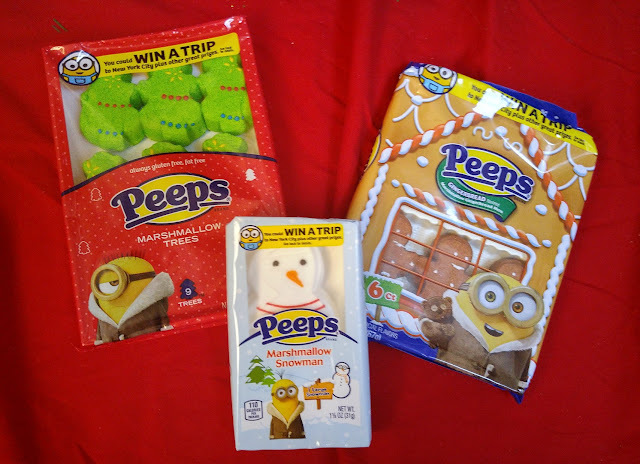 Not only did I find the regular marshmallow PEEPS in holiday packs, I also found PEEPS® Candy Cane Flavored Marshmallow Chicks. 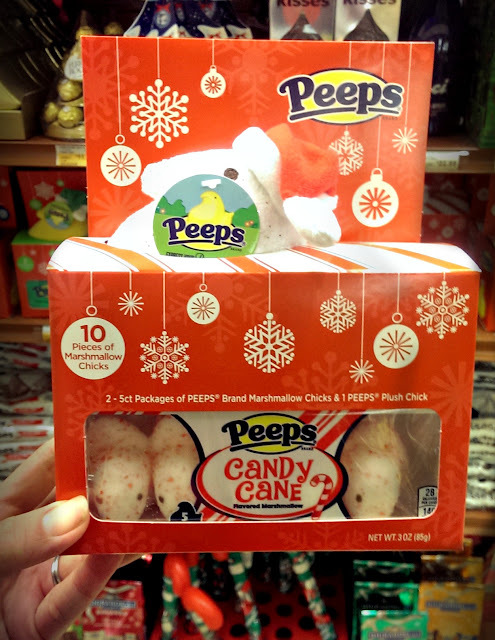 I love how these packs come with a plush PEEPS chick with its own darling little Santa hat. 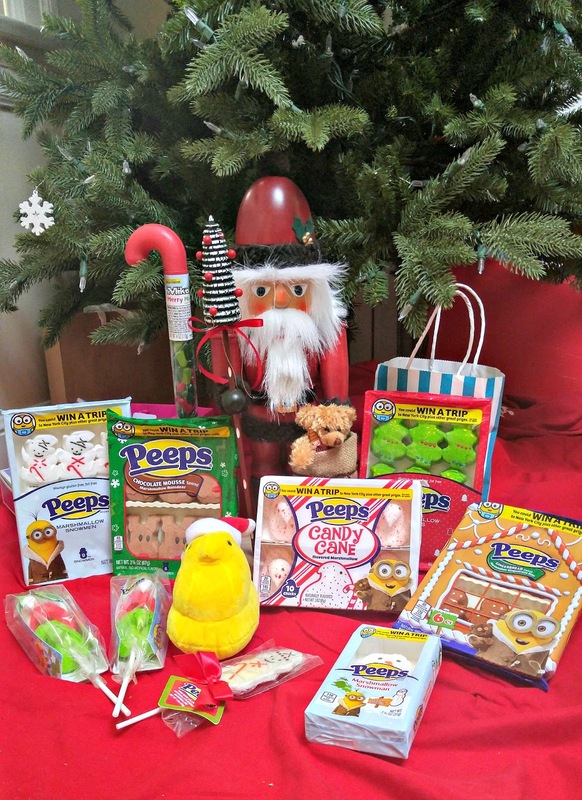 PEEPS sent me a basket of PEEPS goodies so we could get an idea of just how many different kinds of holiday PEEPS products are out there! Check out this Vanilla Crème Chicks Pop -- it's so easy to make. Just buy some lollipop sticks at a craft or candy supply store, then stick on PEEPS chicks in different colors. You can also get the Vanilla Crème Chicks Pop ready-made, so it comes in decorative packaging, all ready for your stocking. PEEPS candy doesn't just come in the classic chick shape! 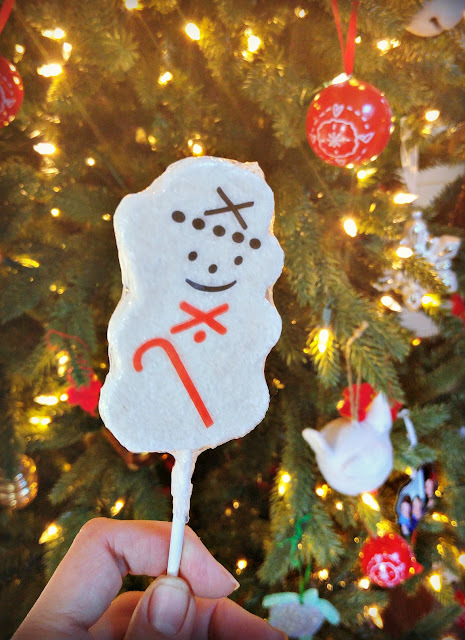 xtra holiday cheer, you can get Gingerbread-Flavored Marshmallow Gingerbread Men, Marshmallow Trees, Marshmallow Snowmen, even a Large Marshmallow Snowman. These are just perfect for a holiday gingerbread house! Why not buy a bunch and have a gingerbread house decorating party. One lucky Bonggamom Finds reader will receive a variety of (5) five PEEPS® and PEEPS & COMPANY® products to use as holiday treats. Enter via the Rafflecopter widget below, but hurry, this giveaway ends on December 17! Disclosure: I received samples for review. Giveaway product provided by PEEPS AND COMPANY. The views and opinions expressed here are my own. 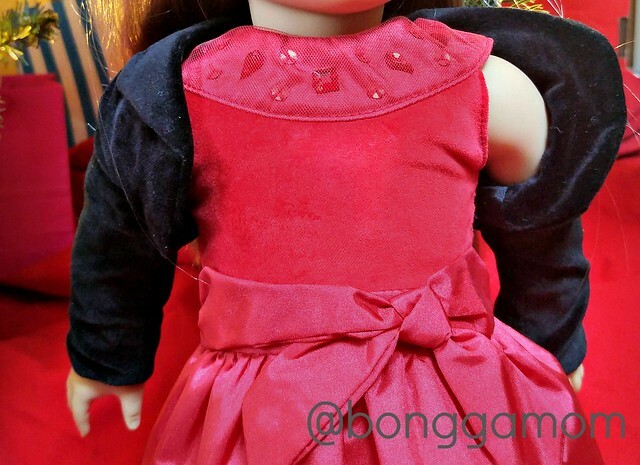 Yesterday I reviewed one of the American Girl 2015 holiday items: the Joyful Jewels dress. But what is a holiday outfit without accessories? 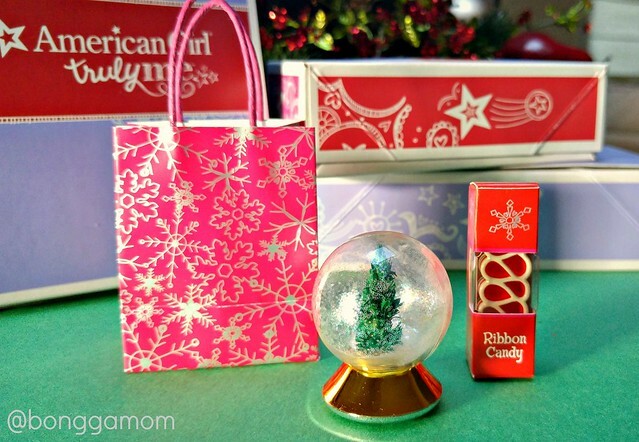 The American Girl Holiday Accessories for Dolls set has everything a doll wants to complete her holiday celebrations. I received a sample of the accessories set to review, and I agree, it's the perfect complement to the Joyful Jewels dress. If you're getting your daughter/niece/goddaughter/granddaughter the Joyful Jewels dress, make sure you get this accessory set to go along with it! Here's a close up of the gift items. The ribbon candy is so pretty, and so is the snow globe. Proportion-wise, I'm not sure the two items work well together (compare the size of the globe next to the size of the ribbon candy; if that globe were the size of a child's palm, that candy would be huge!! ), but I love the level of detail in both of them. Here's a close up of the ring. It fits on American Girl dolls' pinkie fingers or index fingers. 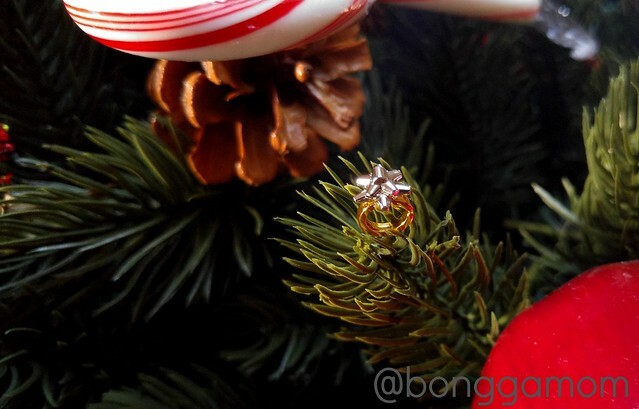 The ring's size is adjustable, but take care because it can easily fall off a doll's finger. How I wish this were available in real-person size! Who wouldn't want to see this under their Christmas tree with their name on it?! 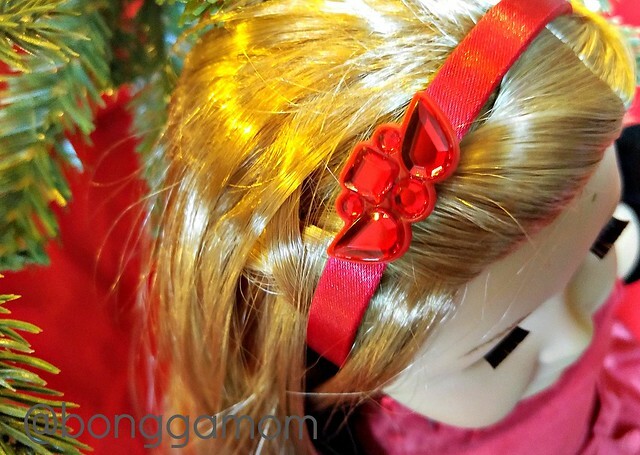 Right now, the Holiday Accessories for Dolls set is on sale for $22 (originally $32) so it's a great deal. Disclosure: I received a sample for review. The views and opinions expressed here are my own. The holidays have arrived at American Girl, and there are gift ideas galore for every girls big and little, and budgets big and little! Right now all their regularly-priced merchandise is on sale at 20% off until December 12, so don't delay, get those presents for your American Girl today! The sale is good at Americangirl.com, the American Girl catalog, and the American Girl stores. I'm really loving the Playful Polar Bear PJ set that American Girl sent me to review! The set (modeled below by McKenna) features a red long-sleeved tunic top with a polar bear graphic and polar bear print pajama leggings. Also included are knit red bootie slippers with white faux fur trim and red rubber bands so you can keep her hair in pigtails or braids. This set is so festive and it looks just like something a little girl would wear. The Cozy Christmas Scene is the perfect backdrop for photographing McKenna in her PJs (or any holiday scene for that matter!). I just couldn't resist purchasing it (especially with that 20% discount), and I'm so glad I did. It really looks as though McKenna is relaxing with her polar bear friend and his holiday present (neither are included in the pajama set nor the backdrop, BTW) in her beautifully-decorated home. At just $12, the Cozy Christmas Scene makes a great inexpensive present. I'd say it would make a great stocking stuffer, but it's too big to fit into a stocking! Disclosure: I received a review sample of the doll pajama set. I purchased the Cozy Christmas Scene and other photo props myself. The views and opinions expressed here are my own. I don't think I could eat cereal every morning for breakfast, but I sure as anything could eat pancakes (or waffles or french toast), sausage and eggs every morning -- or every afternoon and evening! I don't think I'd ever get sick of them, especially when you can always add a seasonal twist to your pancakes or waffles or french toast. Banana Bread French Toast: banana bread with cinnamon bits, dipped in vanilla French toast batter, then grilled and topped with caramel sauce, powdered sugar, and whipped topping. Caramel Bon Bon pancakes: buttermilk pancakes layered with Dulce de Leche cream, topped with caramel sauce and whipped topping. 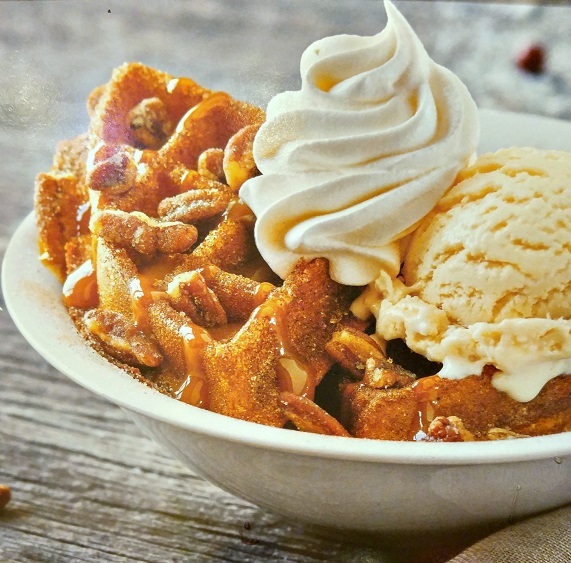 Pumpkin Waffles: Belgian waffles made with real pumpkin, topped with pumpkin spice sugar and whipped topping. Unfortunately, the restaurant was out of caramel syrup (I guess word gets around and everyone ordered a dish with caramel sauce! ), so they weren't taking orders for the Caramel Bon Bon Pancakes. I decided on the Banana Bread French Toast. It was divine! The banana bread had the flavor of real bananas in it, and it was so dense and moist it was almost like a pudding. The French Bread batter gave it a crispy coating, and bananas and whipped topping gave the dish a nice finishing touch. 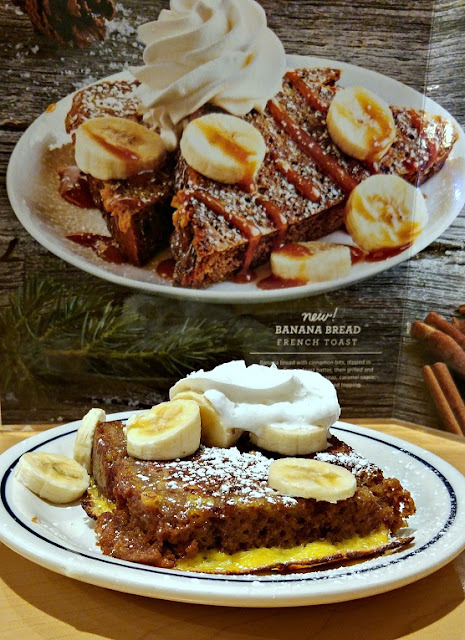 As with most of IHOP's pancakes, waffles, and french toast dishes, you can order Banana Bread French Toast by itself, or you can order it as part of a breakfast meal which includes your choice of bacon or sausage, two eggs (cooked whatever way you choose), and hash browns. The Banana Bread French Toast portion is smaller when you order it as part of a meal. 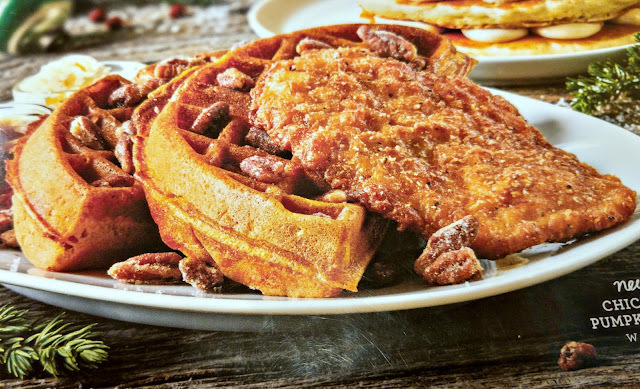 I love IHOP's hash browns, so I can't visit an IHOP without ordering it. 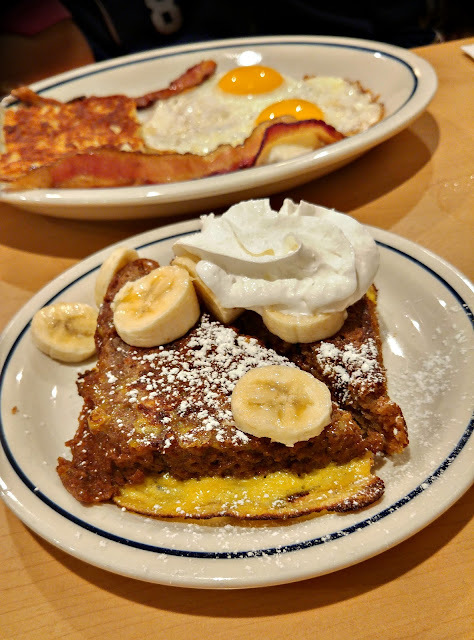 The Banana Bread French Toast was the perfect sweet ending to my meal! ... and don't forget the drinks! Pumpkin coffee (roasted Arabica beans with pumpkin syrup, whipped topping and a sprinkle of pumpkin spice) and Toasted Marshmallow Hot Chocolate (hot chocolate flavored with Toasted Marshmallow Syrup, topped with whipped topping and cocoa powder) are the perfect way to warm up on chilly nights. 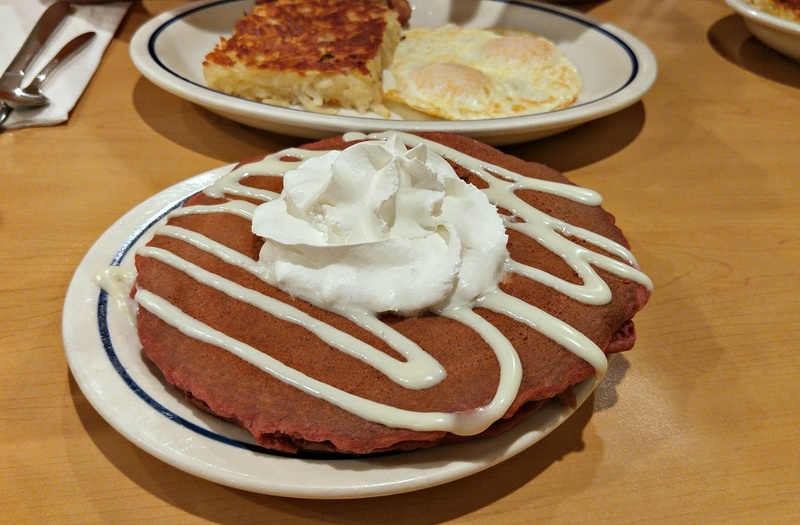 Jammy ordered Red Velvet Pancakes, which are a huge seasonal favorite at IHOP. They taste soooo good when eaten with IHOP's strawberry pancake sauce! 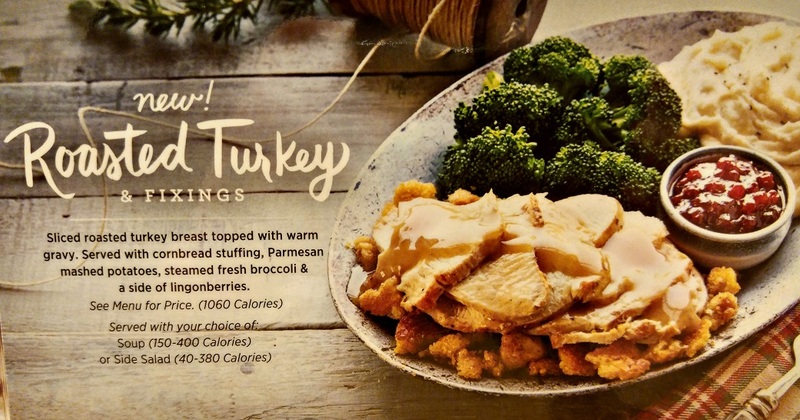 I wish I had the stomach capacity to try all of IHOP's holiday dishes! 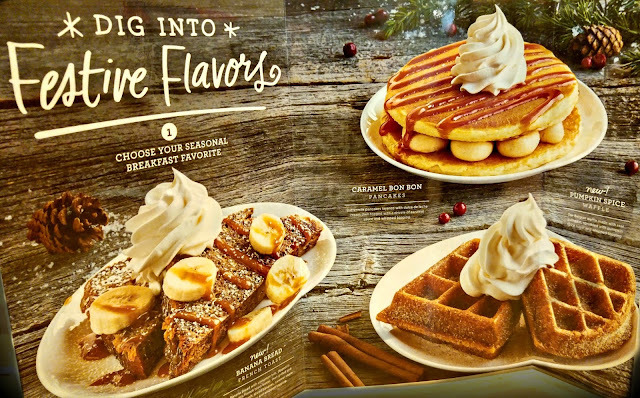 I guess we'll just have to go back and order the rest of IHOP's merry menu -- but just like the holidays, it won't last, so head to IHOP ASAP. 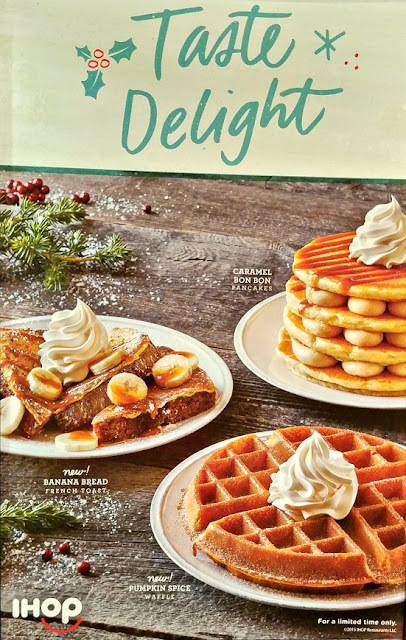 Disclosure: I received a gift card to try IHOP's holiday offerings. The views and opinions expressed here are my own. 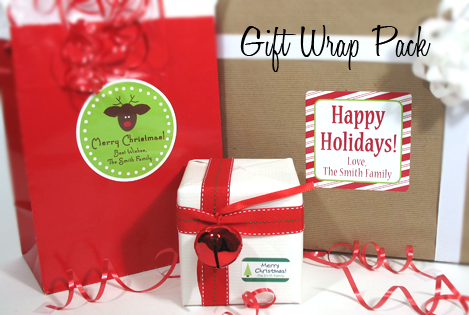 The holidays are here and it's gift wrapping season! We are part of a huge family: we are 5 kids, my mom has 6 siblings, my dad has 4 siblings, and each of them have their own kids! My maternal grandmother has 38 grandchildren and 14 great-grandchildren! That's a lot of presents to wrap. We love each and every one of them, so we want each and every present to be special.... but wrapping all of them can be time consuming! 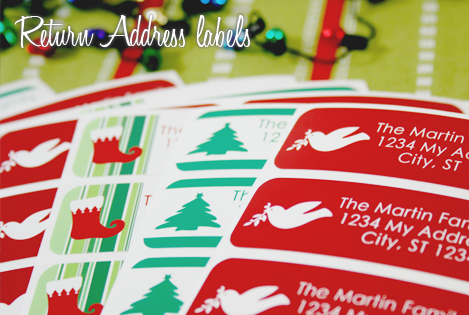 Need return address labels for your holiday cards? Label Daddy has festive holiday designs that will complement any holiday card. 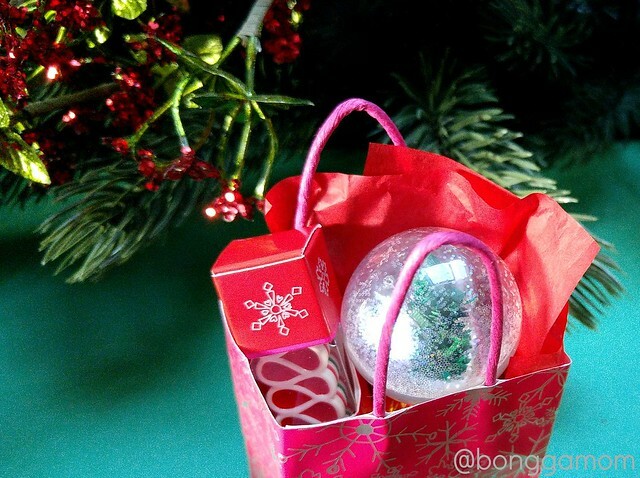 Your recipients will know that they're receiving a bit of seasonal cheer even before they open the envelope! 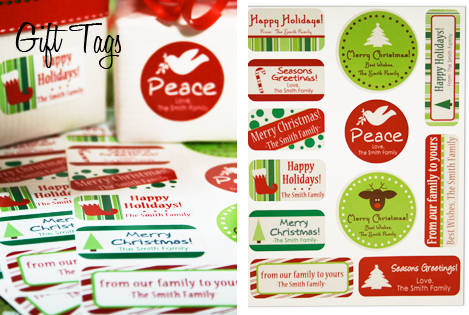 Need gift tags to mark your holiday presents? Check out Label Daddy's holiday-themed gift tags! They'll add a level of pizzazz to your holiday presents because they're personalized with your name and message. These gift tags make it easy to wrap a great looking present without spending a lot of time and effort (which is important when you have 30 cousins to shop for!). For the ultimate in ease, get a Label Daddy Gift Wrap Pack, which includes everything you need to wrap the perfect present. With Label Daddy, your present will look as good on the outside as it does on the inside! It will be almost too pretty to unwrap. Almost. Be sure to stock up on everyday labels too! Label Daddy labels are super durable peel-and-stick washable labels -- they're washer/dryer safe, microwave safe, dishwasher safe and UV resistant! Label Daddy labels are also fun and attractive. You design your own labels! Pick from tons of colors, sizes and logos, including Disney and Marvel characters, MLB, NBA, and NHL team logos, other sport and fun logos, and more. Their exclusive laminated coating gives labels an extra layer of protection and is a must for camp! These labels are made in the USA and shipped directly to you worldwide. Disclosure: I am receiving a sample for review courtesy of USFamilyGuide.com. The views and opinions expressed here are my own. 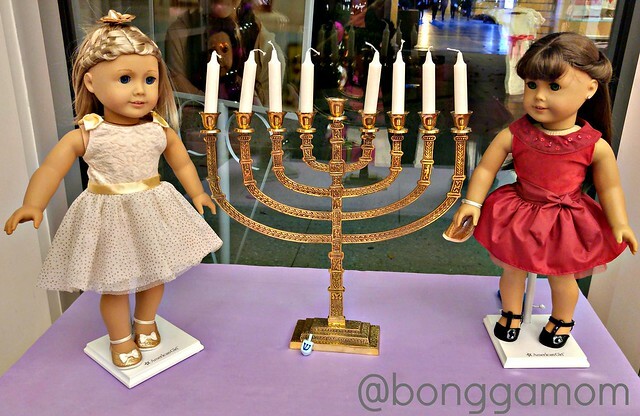 When I first saw American Girl's 2015 holiday doll outfit collection, I was immediately drawn to the Joyful Jewels outfit. There is just something so fun and festive about a red party dress; whenever I see it, it puts me into a holiday mood! When I received a sample of the Joyful Jewels Outfit to review, I got to see the beautiful detail and fell in love with it even more. The dress has a red velvet bodice with a neckline adorned with gems, sequins, and a taffeta overlay. The skirt is red tafetta and tulle, with a taffeta bow. This dress is sugar and spice and everything nice, but it's also fire and sass and a whole lot of class. Note that the black shrug is not included in the outfit; it is included in the Holiday Accessories set (review coming soon!). The outfit also comes with shiny black t-strap shoes and a red headband. Just look at the detail on the jeweled headband! You can also get the matching girls' dress so your American Girl and her doll can match! It's really the perfect outfit for a holiday tea, holiday party, Nutcracker performance, music recital, or family holiday gathering at Hanukkah or Christmas. The girls' dress is on sale right now for $47 (down from $68) which is a really great deal. Disclosure: I received a product sample to review. The views and opinions expressed here are my own. Remember the slogan "Who's that behind those Foster Grants"? 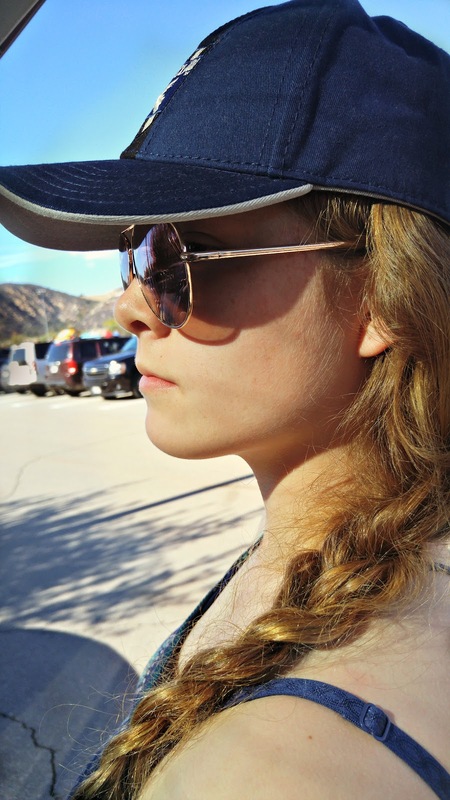 Foster Grant is still around, and their sunglasses are better than ever! 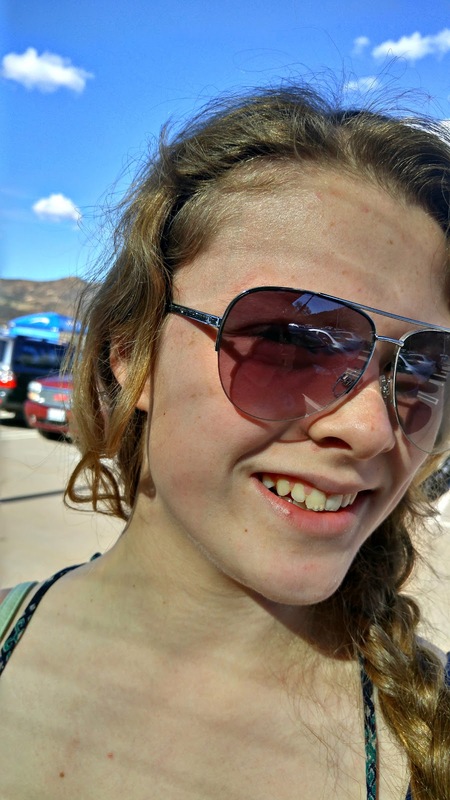 Foster Grant sent me several pairs of their high fashion glasses and they were the perfect accessory for The Pea on last week's road trip to sunny San Diego. She loved the pink and gold toned aviator shades with glittery bling on the sides. They make her look so grown up! I love that they are UVA/UBB protected, so her eyes are protected. I also love that they're so affordable: right now, styles for men, women and children are all under $30. 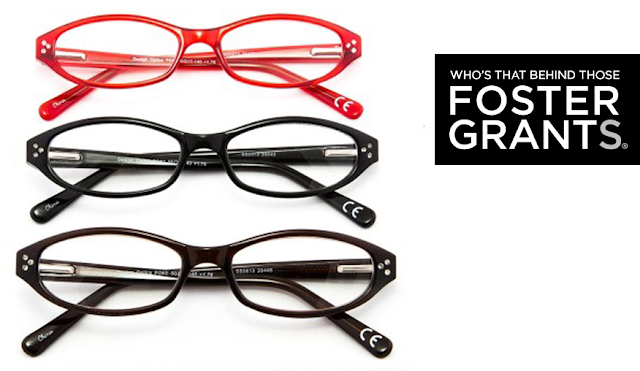 Did you know that Foster Grant also makes high fashion reading glasses for a low price of under $20? This definitely puts Foster Grant sunglasses into the stocking stuffer price range! Who wouldn't want a cool new pair of shades in their holiday stocking? 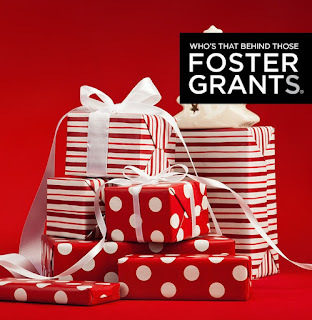 You can find Foster Grants for sale at CVS, Walgreens, Walmart, and online. Disclosure: I received a product sample to facilitate my review. The views and opinions expressed here are my own.